Luke Fuller, who recently completed his BA degree in 3D Design and Craft, has won the top award at New Designers. Luke said it was a “huge honour” to scoop the ‘Business Design Centre New Designer of the Year Award’ at the New Designers in London. The panel of judges commended Luke for his “original” approach to ceramics and saying : ‘People have been working with ceramics for over 3o,000 years, but Luke has managed to bring an original and unique approach to the material.’ Luke received a £1,500 cash prize from the Business Design Centre. 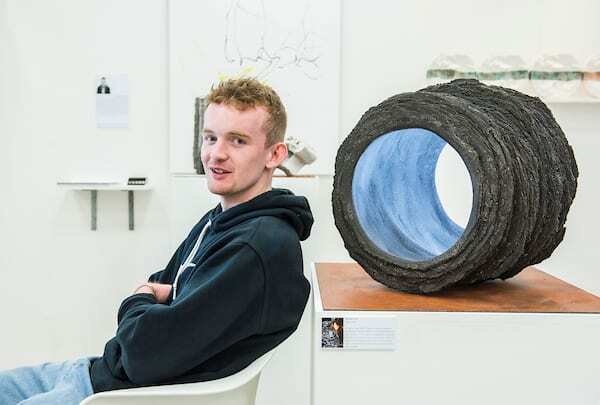 His winning display, which he also exhibited at the recent University of Brighton Graduate Show, was entitled Unearthing Port Talbot. Luke said the award would enhance his portfolio and boost his future academic endeavours: “Being awarded the ‘New Designer of the Year’ prize will both raise my profile as a maker and boost my graduate collection. Luke’s work sought to reflect the industrial heritage of Port Talbot in South Wales, which hosts one of the UK’s largest steelworks, as well as exploring the close relationship between man and natural environment. Luke designed ceramic artefacts that interpreted the human marks that have been carved into the landscape surrounding Port Talbot. The judges of the prize highlighted Luke’s historical focus and how his work was connected “to a sense of place”. Luke said: “My work is strongly influenced by location as every place I visit has its own history, culture and community. This entry was posted in Design and craft, Graduates 2018 and tagged Business Design Centre New Designer of the Year Award, Luke Fuller, new designers.